Clive joined the staff at Wesley House as a Part-Time Research Fellow in January 2019. He has worked in theological education for 30 years, switching between university and church appointments during that time, and being full-time or part-time at different life-stages. Married to Jill, he has been a ‘presbyter’s spouse’ for over 20 years. From 1978 to 1985 he studied in Bangor (North Wales), the University of Tübingen (Germany), the Lutheran School of Theology at Chicago (USA) and the University of Oxford, emerging with a Joint Honours BA in Biblical Studies and German, and a DPhil on the theology of Albrecht Ritschl. He later added a MEd in Lifelong Learning from the Open University (2001-3). He has been a Methodist Local Preacher since 1989 and, after a Merseyside upbringing, and his seven years as a student, has lived in London, Sheffield, Rotherham and Leicester, where he currently still lives. From 2000 to 2007 he was the Secretary of the Faith and Order Committee of the Methodist Church in Great Britain. Since 2009 he has worked at the Centre for Lifelong Learning at the University of Leicester. When the Centre closes in August 2020 and his post comes to an end he will be glad to remain a Research Fellow both here at Wesley House and at the Queen’s Foundation in Birmingham. 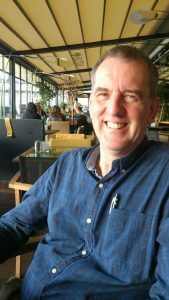 Clive began as a New Testament scholar, mixing his interest in New Testament study with systematic theological interests when undertaking his doctoral work. When he began teaching theology in 1989 he recognised a need to engage students’ interest in popular culture and the arts as a way in to exploring theological themes in a contemporary way. He has since written on the historical Jesus, Christology, theology and film, and theology and popular music. He has published a number of books and many articles. His books include: Christ in Focus: Radical Christocentrism in Christian Theology (SCM Press 2005); Christ in Practice: A Christology of Everyday Life (DLT 2006); Theology Goes to the Movies: An Introduction Critical Christian Thinking (Routledge 2007); Jesus and the Gospels 3rd edn. (Bloomsbury 2015), co-written with Steve Moyise; and Personal Jesus: How Popular Music Shapes Our Souls (Baker Academic 2013), co-written with Vaughan S. Roberts. His latest work, A Cultural Theology of Salvation (OUP 2018) attempts to draw many of his interests together into a work on a single doctrinal theme – salvation – approached by a method which takes non-ecclesial culture seriously. He is currently Vice-President Designate of the Methodist Conference and he and the President Designate, Revd Dr Barbara Glasson, have co-written a short resource book So What’s the Story…? (due out from DLT, June 2019) for their Presidential year (June 2019 – June 2020). Clive has been a member of the Society for the Study of Theology (SST) and the American Academy of Religion (AAR) since the late 1980s and was a founder member (in 2005) of the Theology, Religion and Popular Culture Network, of which has been chair since 2011. He likes football, tennis, lots of different types of music, cinema-going, spending many hours with newspapers (in hard copy) in coffee houses (something of which John Wesley would disapprove) and relishes the time he can spend with his hard-working children and grandson.